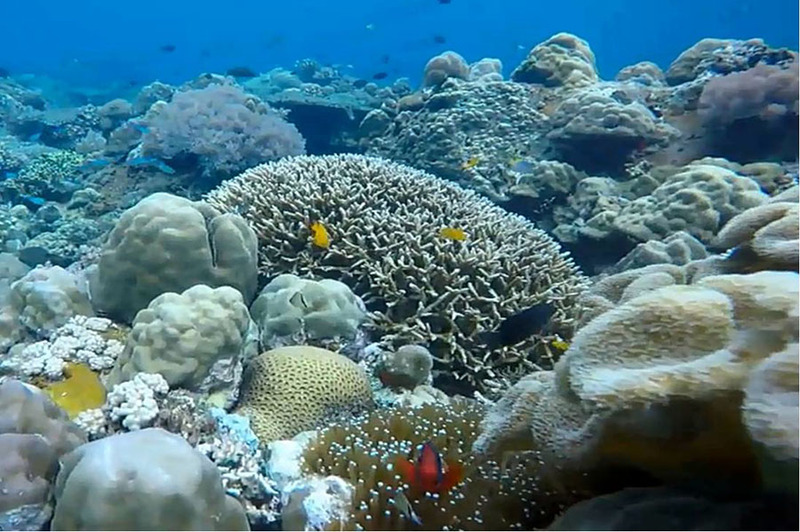 Yoga, Diving and Philippines go together like no other! 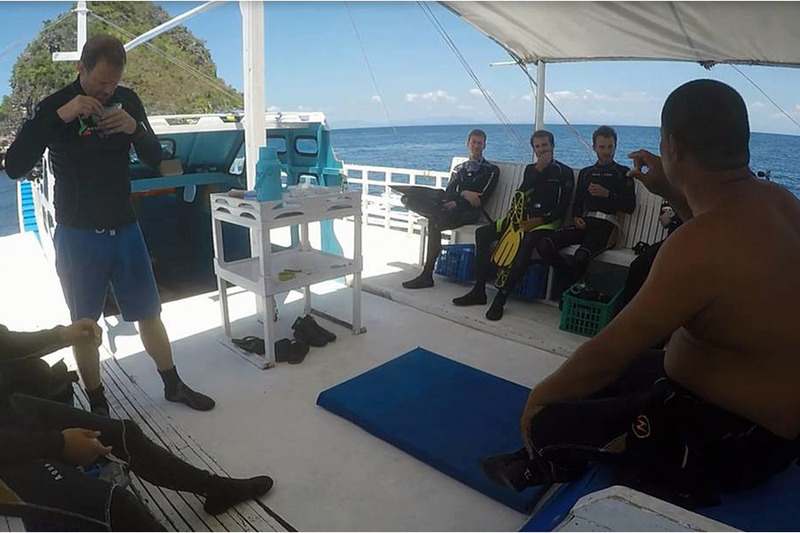 In this article series we are giving you some tips and recommendations on what to do in the Philippines if you have one week or two weeks time planned, and especially – where to go if you want both Diving & Yoga on your daily schedule. 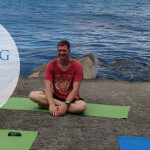 Make sure you read also our guide for Yoga & Diving in the Philippines – 1 week schedule. So you have two weeks in the Philippines, this is a great amount of time to see various spots and get a good feeling of the country. Still, because of the many choices and distances it’s good to limit your destinations to few islands and not try to see too much during your stay. 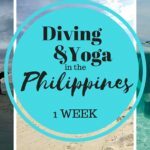 Here’s our recommendation for Yoga & Diving in the Philippines when you have two weeks to spare. Cebu is a great hub for all travelers coming into the Philippines, divers and yogis alike. 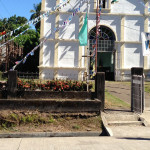 It’s the largest city in the Visayas area, has great international connection to Asia as well as the US and the Middle East. And it has the best connections to other, smaller islands nearby. After landing in Cebu from an international flight, it’s best to take it easy. Since you have 2 weeks, you can first settle into a hotel, visit some malls and prep yourself for the early morning flight to Camiguin island the next morning! Due to the convenient early morning flight it’s best to take a hotel not too far from the airport. Mactan island, where the airport is located, is packed with hotel options. Then again, we often opt for a hotel in Cebu city, and as you’ll be traveling to the airport around 4am, the traffic will not be an issue. Taxi costs are low, around 200php one way (around 4 USD) between airport and Cebu city (unless the traffic is super slow you might end up paying around 300php), so it can be worth it to stay in town. We tend to stay at Capitol Central Hotel which is cheap (around 20 USD / night), clean and in a good, safe neighborhood. Cebu Pacific Airlines flies to Camiguin daily from Cebu City (departure 6am). This is our go-to airline when flying withing the Philippines. They always have plenty of low-cost destinations in the Philippines, and honestly we have always had good service! Sure, there have been some delays and inconveniences along the way, but mostly we’ve only had good experiences. Obviously we are big fans of Camiguin island, and you will not be disappointed either! 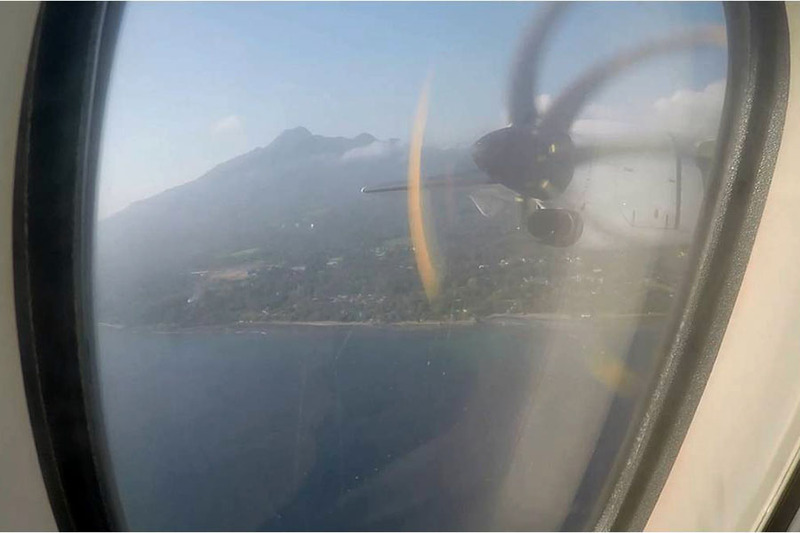 Flying to Camiguin is easy, since the flight takes less than one hour. Marvel the scenery from the plane, the White Island sandbar below, the volcanoes reaching towards the skies, and once you land you’ll really feel like you are somewhere out of this world. A small airport will greet you with open doors and you can smell the fresh air of a tropical paradise. Our driver will pick you up from the airport, and before you know it, you’ll be hanging in a hammock by the seaside, sipping mango shakes and planning the day’s activities – massage to relax, restorative yoga to … relax, and finally sleep. The 5 day Yoga & Diving Retreat is a perfect combination of underwater activities as well as relaxing yoga. Everything is available in the same cozy beach front resort where the staff will always remember to call you by your first name. 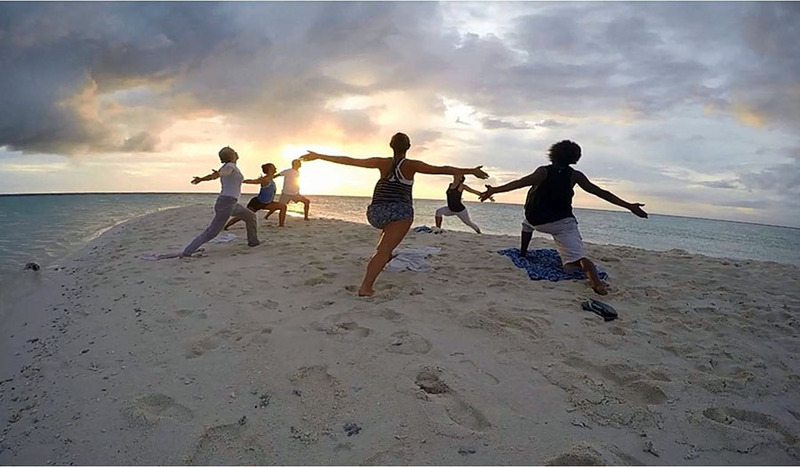 You will be diving in the mornings, and in the afternoons there is a soothing yoga class on the outdoor yoga floor overlooking the ocean. 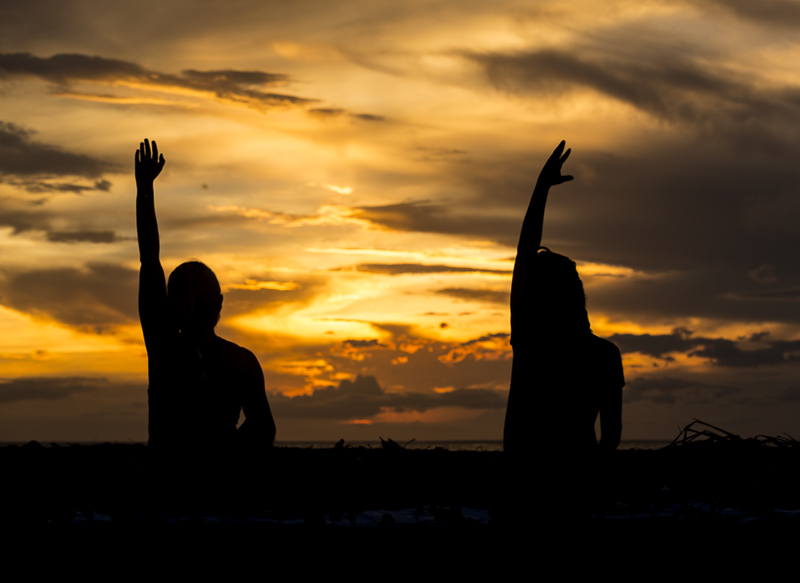 Or choose for a sunset yoga flow on the beach and marvel the setting sun and the changing colors during your class. 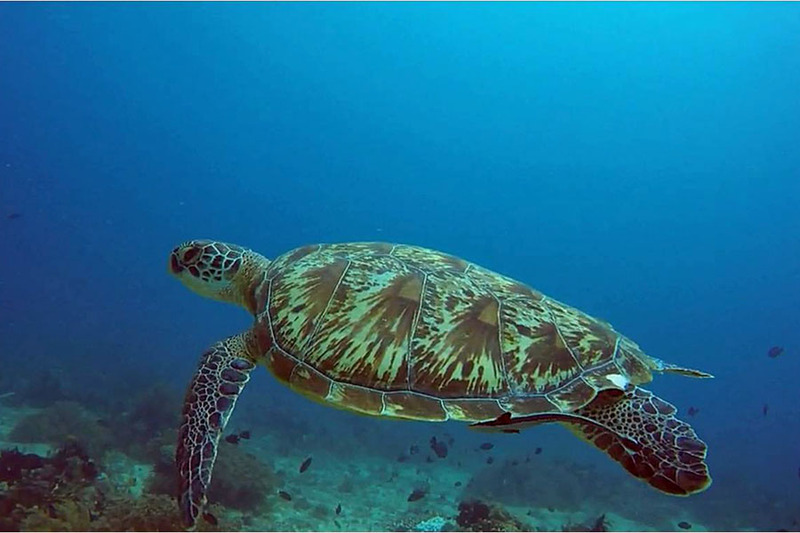 Diving in Camiguin is full of wonderful macro life, colorful and healthy reefs with plenty of reef fish, turtles, and other exotic marine life. The dive sites are easy, suitable for both beginner divers as well as advanced divers looking to explore the tiny, special creatures. 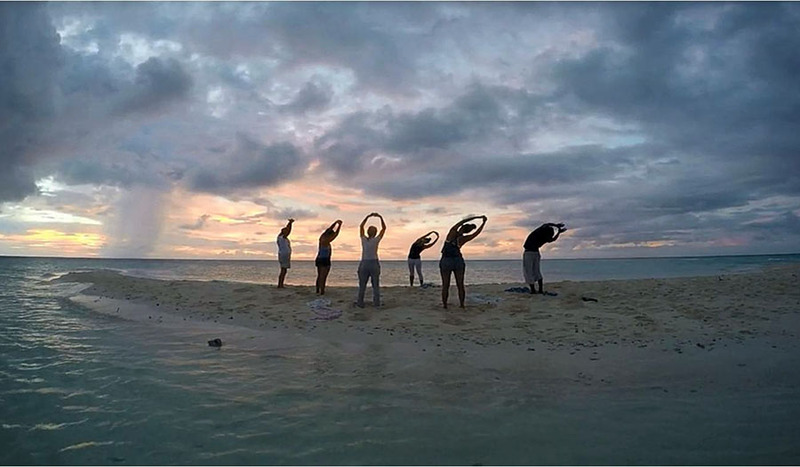 During your last day on Camiguin you can do more yoga, dive some more or choose to explore the island! The 64km road around the volcanic island will offer you beautiful coastal sceneries of the dramatic volcanic island, as well as some scenic fisher villages situated along the quiet and local south side of the island. Pick the waterfalls you want to see, do some trekking or snorkeling if you have the energy and eat some fresh fish! On day 7 you can take the morning flight back to Cebu City, and start your journey to another island paradise, Malapascua Island. Malapascua is situated on the north tip of Cebu Island, and you can take a bus, van or a taxi there from Cebu City (last bit is by boat). You will land early in Cebu, so you’ll have time on your side. The most local, and budget friendly way is to take the bus. You’ll have to take the taxi to Cebu North bus terminal, during which the taxi driver will most likely offer to take you to Maya city himself (2’500php would be average price to pay, and no matter what the driver says, it will take at least 3 hours). 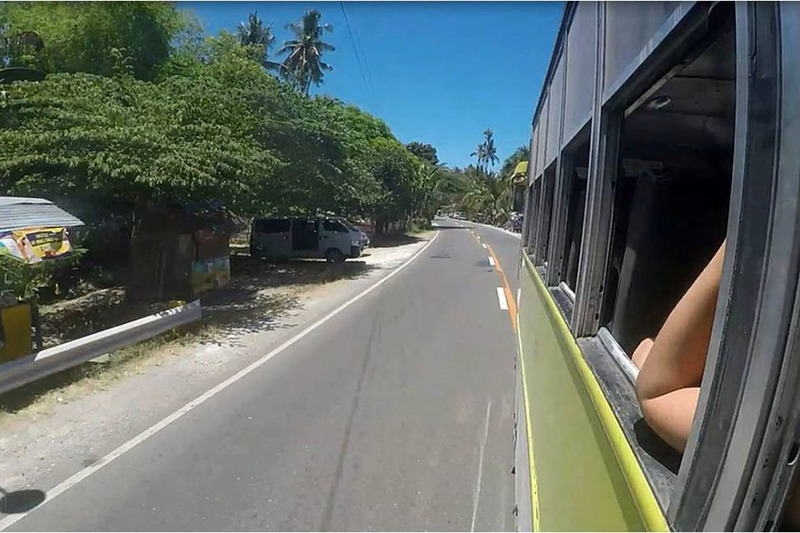 The bus to Maya, the coastal town where the boats to Malapascua are leaving, costs roughly 300php (payment will be collected on the bus), and without heavy traffic takes approx 4,5 hours. The bus will make a pit-stop half way for a toilet break and you can buy some more water and snacks. Once you reach Maya, the bus will drop you off close to the boats. 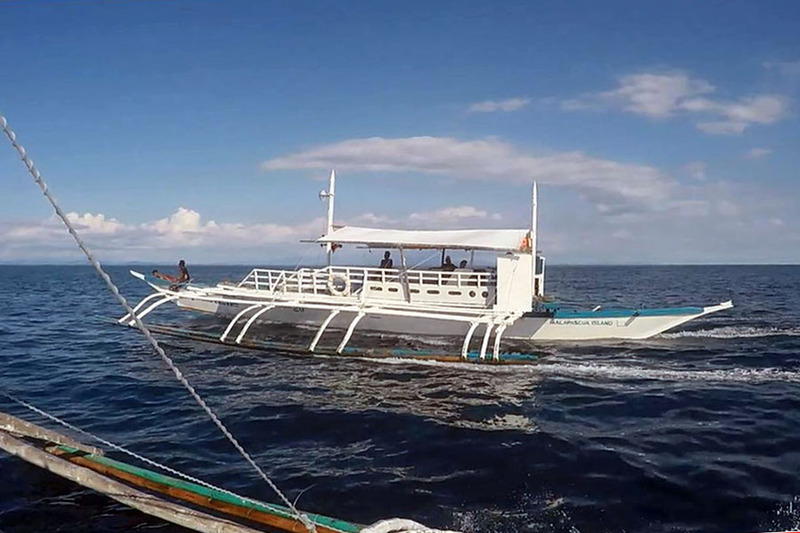 There are no ferries going to Malapascua, but just large Banka boats which will wait until they have enough passengers before leaving towards Malapascua. Payment is collected on the boat. 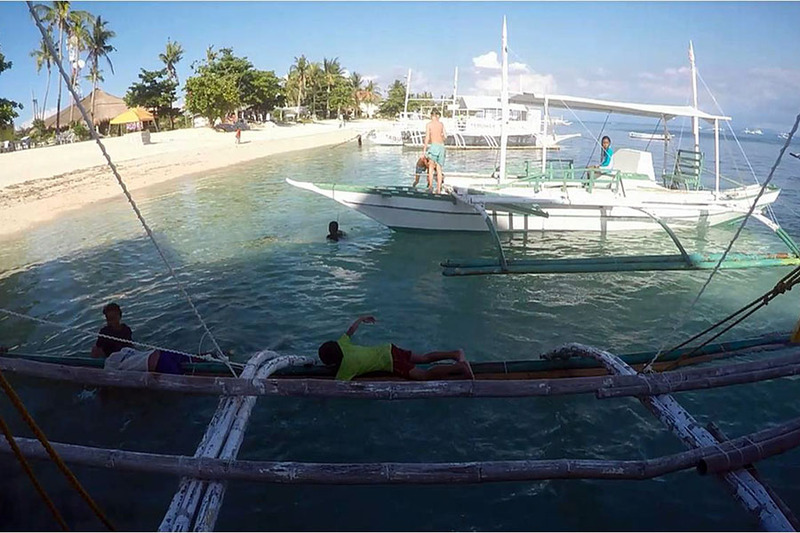 If the tide is low, prepare to be scrammed into a small rowboat, which will take you to the banka boat. For this ride you’ll have to pay 20php per person, and another 20php if you’re carrying large luggage. Malapascua is something else. 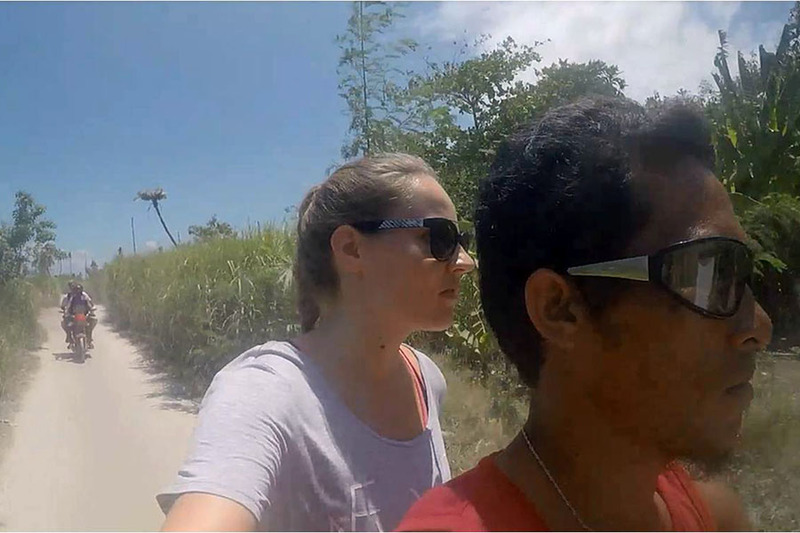 There are no cars on this island, and the only mode of transport is Habal habal, a motorbike ride. This is quite nicely organized, one way is always standard 20php no matter where you go, and after dark it’s 40php. The flat island is surrounded by white sandy beaches, most in their separate coves accompanied by resorts or restaurants. 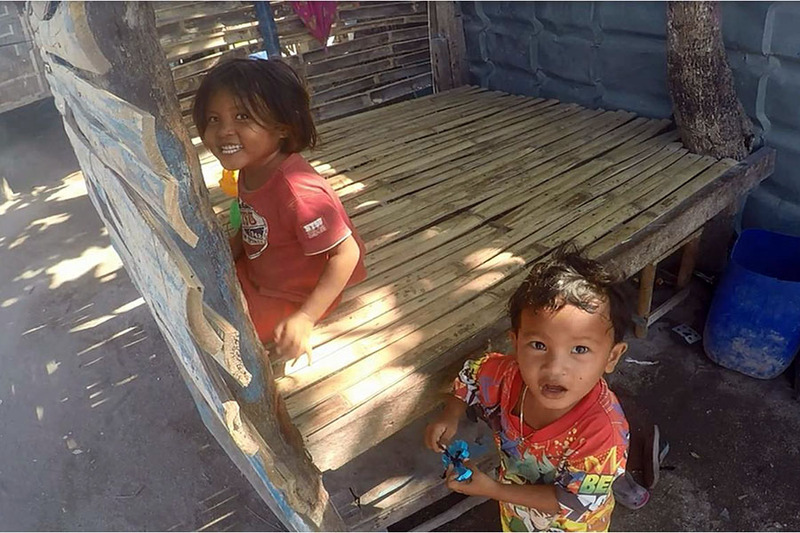 There are enough modern commodities, place to sit and hang out and mixed cuisine to eat, and yet the locals live on the island like there were no modern life 5 meters from their huts. This mix of relaxed tourists and locals co-exist in a unique harmony, and it makes the island all the more charming! 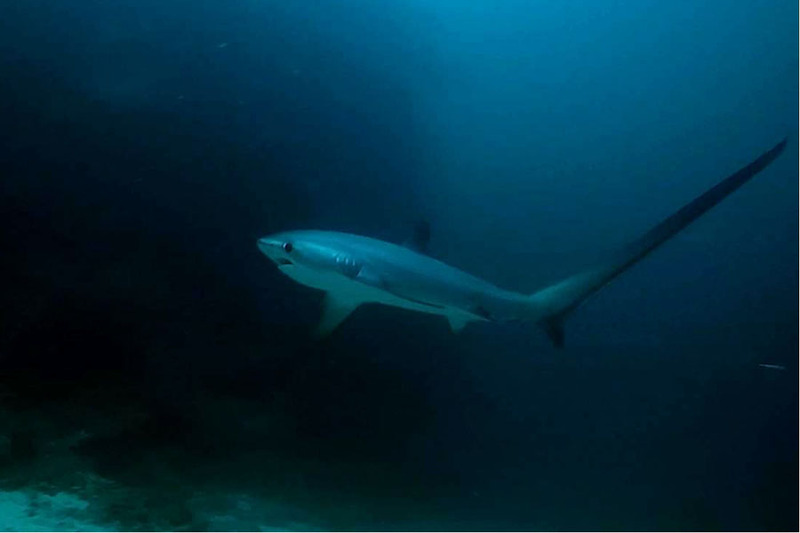 One of the main attraction for diving in Malapascua are the Thresher Sharks. 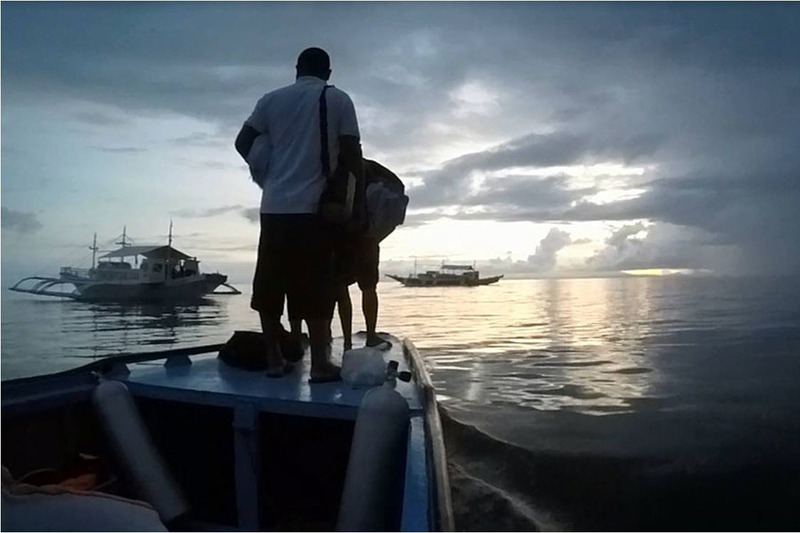 This is always an early morning dive (departure around 5am) just on time to catch the sunrise from the boat. Depending on the dive school, it takes about 30 minutes to get to the sharks and see them during their cleaning station time in about 28m depth. Our go-to Dive Shop and accommodation while on Malapascua Island is Thresher Cove Resort & Dive Centre. Situated on a private small beach, they have a great Dive Shop, fun staff and accommodations vary from dormitory type rooms to private villas. Another worth while dive trip to make is the 2-dives day trip to Gato Island. This is a small island about 1 hour away from Malapascua, and usually a guaranteed spot to see white tip reef sharks. 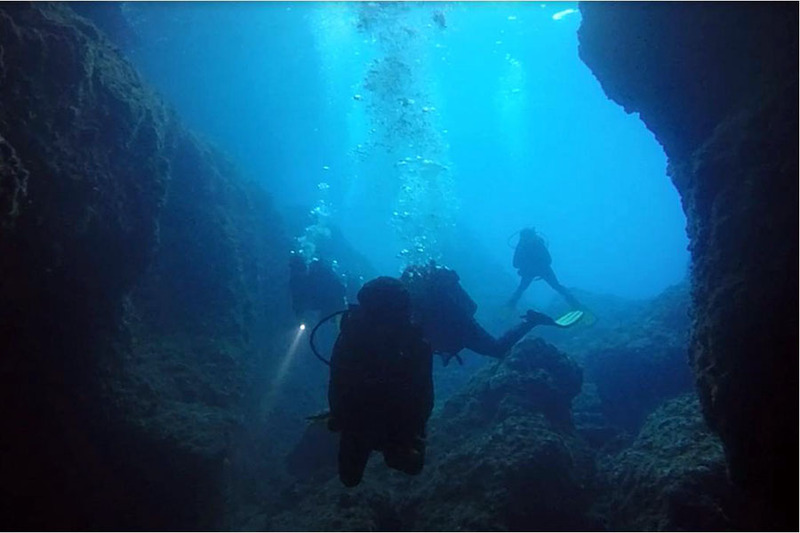 One dive enters in a tunnel, and exits on the other side of the island. During this 10 minutes spent in the tunnel you’ll most likely see some sharks around, which is definitely a cool experience. If you like small stuff, like nudibranchs and pygmy seahorses, they’ve got you covered as well! As for your daily yoga fix, you can head over to the Buena Vida Resort & Spa for some serious relaxing! This amazing oasis of peace and tranquility is situated in town, but as soon as you enter the flower covered doors, you feel the peace and quietness. They have daily yoga classes that you can sign up for (400php per class), done on their outdoor yoga deck overlooking the garden. You should definitely also try their massage treatment, they will send you to another realm with aroma therapy and private, candlelit massage rooms. They also have beautiful accommodation available, should you wish to stay closer to yoga rather than diving. Take the day to head back to Cebu with time on your side. 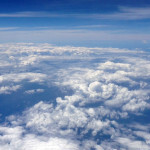 The connections are always unpredictable, and you’ll want to have enough time before your international flight back home. So always leave 1 day before your flight. Your Habal Habal driver will drop you off at the ‘port’ where the boats will take you back to Maya. 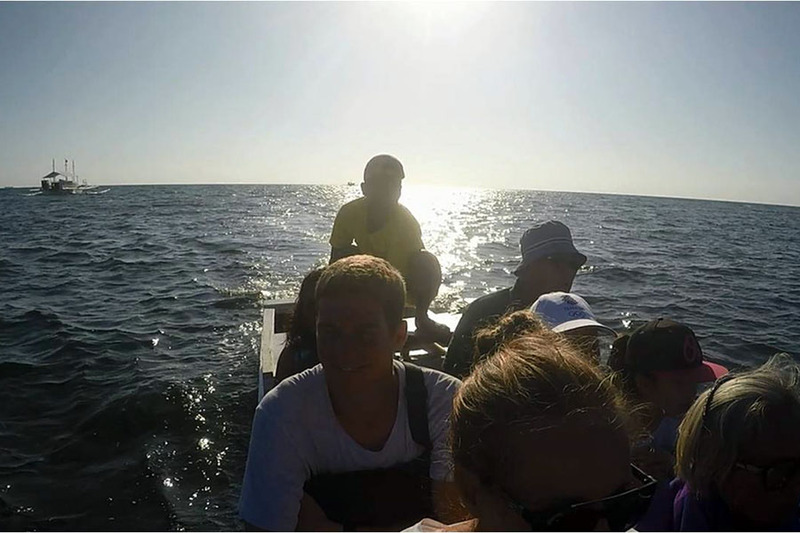 Depending on the tide, you’ll have to take a small rowboat again to the bigger boat, and in this case your luggage will also cost a full seat. This is not comfort travel so be prepared to be wet and cramped, but it’s still fun! Once you get to Maya, look for the bus although there might be aircon vans waiting for you. It may look like there is ample space in the van, and it may go faster than the bus, but it’s not worth it unless you are very comfortable with crowded spaces and able to sit +3.5 hours without stopping. The van will be filled, more than filled (20+ people in a 9-persons van), with people, since in the Philippines there is always room for one more! Buses may be a bit slower, but they have space to sit comfortably, and they have dedicated stops they make. In the vans you are at the mercy of the driver’s whim. We ended up buying an extra seat for our legs, otherwise we would have gotten off the van on the side of the road to wait for the next bus. Bye bye Philippines, I’m sure you will come back again after seeing the beauty that this country has to offer! 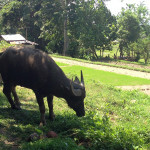 Only have 1 week in the Philippines, and you’d like to maximize your time? 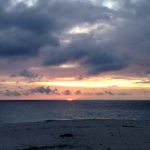 Read our article about Yoga and Diving in the Philippines when you only have 1 week.